You will be given a reference e-book to read which has 215 pages And the test will be based on that e-book , you can take final test within 1 year of purchase. Strategic management is the process of systematically analyzing different factors linked to the external environment which include customers and competitors and the internal environment which include the business establishment or organization itself with an aim to maintain the best and the most favorable management practices. One of the major goals of this process is to attain a more improved alignment between strategic priorities and corporate policies. The entire strategic process is a continuing one. This means that the person who has received a strategic management certification will continue evaluating and controlling the organization which he is a part of and the industries that are linked to the organization, assessing the competition, setting strategies and goals that can meet the demands of present and prospective competitors and re-assessing every strategy used either quarterly or annually so the company will know if it is effective enough or needs to be replaced. Completing a strategic management course will definitely hone your management skills while making you realize that the entire strategic management process consists of four basic components namely the environment scanning, strategy formulation, strategy implementation and strategy evaluation. 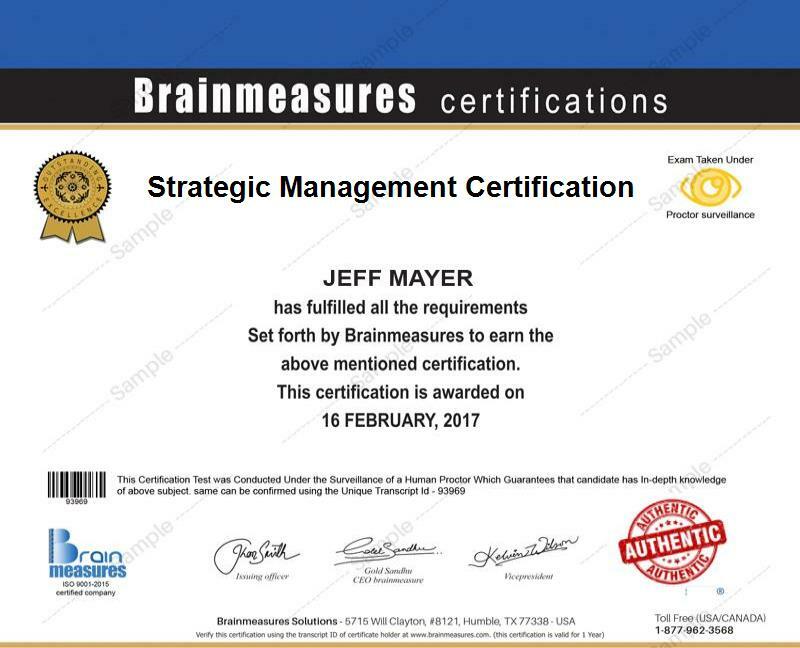 If you are serious about getting a strategic management certification, then you should consider checking out the program offered by Brainmeasures’ related to this course. What sets Brainmeasures apart from the rest is its wonderful learning environment. As soon as you complete the program, you can take the strategic management exam which will bring you closer towards getting your certificate. Another advantage of enrolling in the strategic management certification program offered by Brainmeasures is that this online skill testing company is ISO certified and the exams are developed by experts who are extremely reputable on their own fields. Mentioned above are just few of the many things that you will definitely learn from completing the strategic management certification course offered by Brainmeasures to everyone. The good thing about the strategic management certification program from Brainmeasures is that it does not require you to meet certain qualifications, meaning anyone who wishes to improve their management skills and become an effective strategic management expert can be admitted into the program. This program is highly recommended for owners of small, medium or large business organizations, level managers, company officers, senior managers, directors and executives who are responsible not only in the creation and implementation of effective strategies but also in making the organization which they are a part of a leader in its own industry. Your salary after getting your strategic management certification is decent enough that you can enjoy living a more financially free life. You can get as much as $85,000 annually as a beginner in the industry and $150,000 per year as soon as you get a lot of experience. Bonuses and other financial benefits are also provided depending on your employer.